The Reserve Bank of India's mid-quarter monetary policy review on June 16 amplifies the threat to the fiscal health of the government. With persistent inflation and lacklustre direct tax collections casting a shadow, there could be a moderation in RBI's growth forecast for 2011/12. The central bank, however, kept its economic growth outlook unchanged at about eight per cent. RBI increased the repo rate - the rate at which banks borrow from it - by 25 basis points, or bps, to 7.5 per cent (100 bps is equal to one percentage point). This also means a 25 bps hike in the reverse repo rate - the rate at which banks park funds with the RBI - to 6.5 per cent. RBI's guidance on the direction of monetary policy indicated rates could be nudged up a while longer as "inflation risks remain high". May inflation stood at 9.06 per cent, roughly double the central bank's comfort level. While RBI said inflation persisted at uncomfortable levels, that it was spreading to nonfood items was a cause for concern. 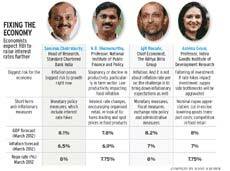 Experts are worried hardening rates will bite into corporate profitability and impact direct tax collection in coming months. In addition, global crude oil displayed a rising trend in the first fortnight of June threatening to send the Centre's provision for energy subsidy out of control. The first tranche of quarterly advance tax till June 15 was at least 10 percentage points lower than what the finance ministry would have wanted to offset high refunds this year. Aggregate advance tax collections had not come in at the time of going to print, but collections from the top 100 corporate tax payers in Mumbai grew about 14 per cent more than the year-ago period. Generally, the Mumbai numbers serve as a trailer to what lies ahead. Tax refunds of Rs 37,451 crore in April and May, a growth of 217 per cent, mean the net direct tax collections so far are lower than needed.